The party of leftist presidential candidate Andres Manuel Lopez Obrador demanded a ballot-by-ballot recount Tuesday in Mexico's closest-ever presidential race, claiming vote counts were manipulated and renewing fears of violent protests if the fiery politician doesn't get his way. Lopez Obrador's demand for a full recount of all 41 million votes cast in Sunday's vote set up a possible marathon showdown that could go to Mexico's electoral courts, stirring memories of the bitter Florida recount in the 2000 U.S. presidential race. "We are going to launch a battle for the legitimacy of the election," said Leonel Cota, president of Lopez Obrador's leftist Democratic Revolution Party, while the candidate trailed conservative Felipe Calderon by about 1 percentage point in preliminary tallies. 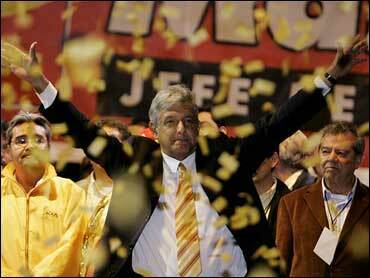 "We are convinced of the triumph of our candidate," said Jesus Ortega, Lopez Obrador's campaign manager. "We will demand a recount vote by vote, report by report, polling place by polling place." At the close of voting Sunday, volunteers at tens of thousands of polling places counted the ballots in each box and attached a report, sending it to district headquarters. A preliminary count of those tallies gave Calderon of the ruling National Action Party a 400,000-vote advantage over Lopez Obrador. But electoral officials said Tuesday that about 3 million ballots were not part of that count due to problems including ballots that were set aside for being incorrectly marked or appearing invalid. Lopez Obrador initially said such ballots were "missing," but electoral officials said the ballots were in their control and would be examined — and counted if valid. Interior Secretary Carlos Abascal said recounting every ballot was "physically impossible and also legally impossible." Abascal said the votes in question had been "been well accounted for and don't change the results" of the preliminary count. Abascal, however, does not have authority over electoral matters. Under election law, the Federal Electoral Institute will review the ballot-box totals and count all remaining valid votes beginning Wednesday to compile the official results. The president-elect will be named when that count is complete. Lopez Obrador's party demanded a full review because it claimed some voting places were counted twice while others weren't counted. They will also demand that all voided ballots be reviewed. meet the party's demands. Mexican law allows for a manual recount only if the sealed packages of ballots have been tampered with, or if the tallies are obviously miscalculated, wrongly filled out or illegible. Luis Carlos Ugalde, president of the electoral institute, suggested there would not be a major recount. "In exceptional cases, you can open the electoral package but ... the votes were already counted Sunday in the presence of the parties," he said. Financial markets and the peso rallied for a second day Tuesday as traders apparently believed Calderon, a former energy secretary, would reach the presidency. Calderon told Radio Formula on Tuesday that they were on the right track. "The people are right, the markets are right in treating this as fact," said Calderon. Calderon said he would negotiate with other parties to build an agenda for his six-year term, and he urged Mexicans to put questions over the vote behind them. Lopez Obrador's party expressed fears that the third-place Institutional Revolutionary Party, or PRI, was in talks with Calderon and might recognize the results in exchange for Cabinet posts. PRI candidate Roberto Madrazo's campaign conceded defeat on Monday night. There were scattered demonstrations in Mexico City in favor of Lopez Obrador, but they were small and peaceful. Jorge Espindola, a 36-year-old supporter who decorated his 1980 Volkswagen Beetle with Lopez Obrador campaign signs, said supporters will remain calm. "There may be demonstrations ... but there won't be any violence," he said. Lopez Obrador's critics have said he would be a radical force akin to leftist President Hugo Chavez of Venezuela. He has denied links to Chavez, though he has won strong support from Mexico's poor by promising a change from six-years of conservative policies under outgoing President Vicente Fox, whose historic victory in 2000 ended 71 years of PRI rule. For decades, Mexico's elections were rigged to ensure the ruling party's victory under the PRI — fraud that allegedly included the 1988 presidential count in which a computer crash was blamed for a stunning turnaround that ensured another six years in power for the party. Victor Gonzalez, a drugstore chain owner who mounted a quixotic write-in campaign for president — even though electoral law says such votes can't be counted — filed a complaint because authorities declared the ballots void. It was unclear if those accounted for any of the questioned votes. Analysts estimated that while no party would have a majority in Congress, Calderon's party could greatly increase its representation to between 208 and 210 seats in the 500-member lower house, with Lopez Obrador's party getting about 160 seats and the PRI garnering about 120. Preliminary counts were similar in the 125-seat Senate, though electoral officials had yet to declare winners in many races.